2019 Runner Instructions will be added prior to race day! Preferred packet pick up including shirts and goody bags will be from 3 p.m. – 7 p.m. June 7th in St. Regis at the Community/Visitor’s Center. Some race numbers can be picked up on Saturday at the St. Regis Travel Center from 5am until the shuttle bus for each race leaves, at which point the remaining running bibs will be sent to the starting line. This will not include access to shirts and goody bags which will be at the finish line. Make sure you have your bus ticket! Get the latest news and information for the Trail Rail Run on our Facebook page, www.facebook.com/TrailRailRun. Like us today! Or, follow us on Twitter: https://twitter.com/TrailRailRun. Also, be sure to check the BLOG posts on this website. 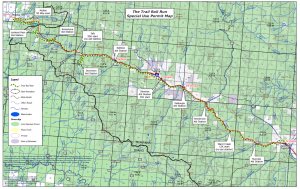 In keeping with our western Montana heritage, the Trail Rail Run utilizes old railroad grades from both the Northern Pacific Railroad and the Milwaukee Railroad. These wide railroad beds are dirt and gravel, and are never more than a 2% grade, making the Trail Rail Run a great alternative to road running. The running surface is forgiving, and the course won’t require the intensity of training that single track or steep and difficult inclines can demand. 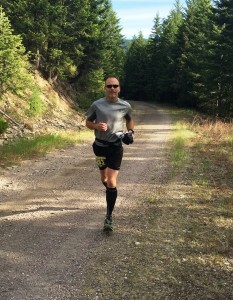 Altitude: The highest point of the Trail Rail Run is at Lookout Pass, an elevation of 4,700 feet. Only the 50 Mile participants cross Lookout Pass. The start of the 50 Miler is at 3,278 feet in Mullan, Idaho, and you have 8 miles to gradually ascend to Lookout. The lowest point of the Trail Rail Run is at the finish in St. Regis, at 2,635 feet. Trail Rail Run will make every effort to provide individual, 50-Mile Finishers a jacket, however, any registration after April 18th, will not be guarantee a jacket or that the jacket will be available the day of the race. All participants, no matter which event, must have crossed the finish line in St. Regis by 9 pm, Saturday, June 8th. Packet Pick Up takes place at the St. Regis Visitor Center/St. Regis Community Center on Friday, June 7th, from 3pm to 7pm. Sustenance at your aid stations is brought to you by St. Regis Community Council, Hammer Nutrition and your lovely aid station volunteers. There are nine Aid Stations on the course. A variety of foods, water and HEED endurance drink by Hammer Nutrition will be available at aid stations. Assortment includes items such as jelly beans, peanut butter and jelly sandwiches, potatoes, pretzels, granola bars, oranges, Endurolytes by Hammer Nutrition, Hammer Gel, homemade cookies, pickle juice, and the like. There is a medical person at each aid station with basic medical supplies. There is also a HAM operator and transportation to the finish area if necessary. There are toilets at aid stations, the beginning, and finish. GEAR BAGS Runners of the 50 Mile, 50K and 30K may leave gear bags at the start which will be transported to the finish. Gear Bags hold your clothes that you are wearing when you are standing around at the starting line – Like an extra sweatshirt or sweatpants that you don’t intend to wear while running. There is a designated vehicle to return the Gear Bags to the finish area, where the gear bags will be waiting for you. Be sure to mark them well. We are not responsible for lost items. DROP BAGS Additionally, 50 Mile registrants may prepare two (2) drop bags and 50K registrants may prepare one (1) drop bag. Drop Bag location #1 for 50 Mile participants is at the Dominion Trestle Aid Station (#3). Drop Bag location #2 for both 50 Mile and 50K participants is at the DeBorgia Aid Station (#7). Drop Bags are bags that you prepare for yourself with items you wish to access on your run. Extra nutrition, sunscreen, balm, a change of shoes, socks, etc. You leave it at registration, we take it to the respective aid station, you use it, we bring it back to the finish. Mark it well. We are not responsible for lost items. Bus shuttles to the starting lines will start in St. Regis and transport runners to the 50 Mile, 50K, 30K and 12K starting lines. Fees are $15 for the 50 Mile or the 50K, $10 for the 30K, and $5 for the 12K or the 5K (minimal to no parking at the 5K or 12K start). Top 1st, 2nd and 3rd place finishers – Male and Female for each solo running event receive prizes from Fleet Feet Sports of Coeur d’Alene. Top three in each age group will be recognized at the award ceremony. Cool shirts, great scenery, good food and a great time. Cross the finish line and receive your own used railroad spike with engraved plate. For a processing fee, you have the ability to make changes in your registration up until Thursday, June 2nd. You can make edits in your registration by going to the Registration Page and clicking on the appropriate link.